Nichkhun, a solo artist, presents three teasers with his first solo album "ME." 2PM Nichkhun unveiled the teaser for his first solo album "ME" for the first time and showed off his deadly visuals. JYP Entertainment recently told his fans that, a member of the group 2PM Nichkhun will release his first solo album "ME" at 6 pm. on this coming 18th. 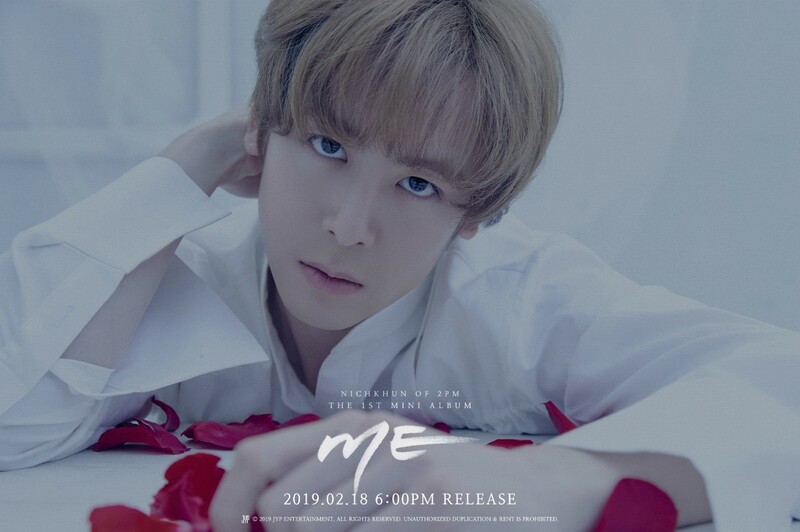 JYP revealed its tracklist image of the Nichkhun album "ME" on the 11th and first released three teaser images containing the concept of his first solo album on his official SNS channel at 2PM on the 12th. Nichkhun in the teaser was wearing a white blouse and showed off his cold look. He also created a deadly sensation as he contrasted with the red rose petals, sparking curiosity about the concept of his first solo album. Nichkhun participated in writing and composing a total of nine songs from "HOME" to "Umbrella" on his solo album "ME," which will be released 11 years after his debut, to show his talent as a solo artist. All the tracks are in English, and 'Umbrella,' a fan song, it also has korean version..
Nichkhun, "Asia Prince," is popular in many parts of Asia. The award ceremony hosted by JSTYLE, a major magazine in Beijing, China, on 15th of last month, won the "Asian Influential Idol Award" for the award ceremony "2019 AWARDS FEIA." In addition, he held fan meetings in Beijing and Nanjing, China in October and November last year, and starred in the Chinese Tencent drama "Shall we fall in love" which captivated the local fans. Japan released its first solo album "ME" in December 2018, and held his first solo concert ‘NICHKHUN (From 2PM) Premium Solo Concert 2018’ “HOME" in November and December of the same year on a scale of five times in Osaka and Tokyo. Meanwhile, the Thai movie "Brother of the Year" starring Nichkhun has confirmed his movie release in Korea in March, raising expectations among his fans.